The ADB tool is located in C:\android-sdk-windows\platform-tools. This path needs to be added to the windows $PATH environment variable. 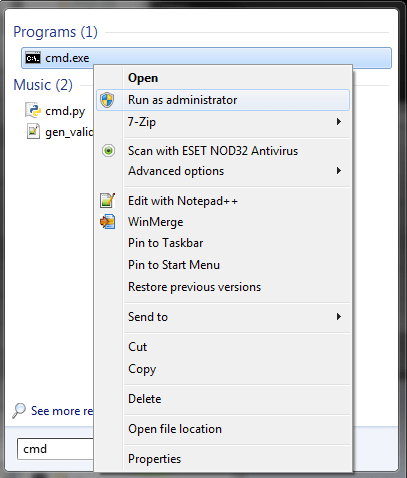 Start the command line by typing cmd into the search bar of the start menu. The correct result is cmd.exe. Right click on this item and select Run as administrator. It may popup with some dialogue boxes but OK / approve them. To test it works, close the command line and then restart it again. This time it does not need to run as an administrator. type adb shell and it should go to the command prompt which is a # symbol. I.T software professional always studying and applying the knowledge gained and one way of doing this is to blog. Danny also has participates in a part time project called Energy@Home [http://code.google.com/p/energyathome/] for monitoring energy usage on a premise. Dedicated to I.T since studying pure Information Technology since the age of 16, Danny Tsang working in the field that he has aimed for since leaving school. View all posts by Danny →	This entry was posted in Mobile Phone, Programming, Windows and tagged adb, Android, cmd, PATH, SDK, shell, software developer kit, Windows. Bookmark the permalink.